We are also able to supply many other non-standard compounds on a short lead time. Polymers such as Silicone, EPDM, Kalrez®, FFKM, HNBR, PTFE, XNBR, PU, CR and more. We can provide a range of shore hardness (40 to 90 ShA) and a variety of colours. Cost effective with the biggest choice of sizes available to buy online. Commonly used in applications requiring resistance to oil, fat and grease. (-30°C to +90°C). FKM O-rings are typically used in applications where resistance to wide range of chemicals and high temperature is crucial. (-15°C to +200°C). Excellent resistance to weathering, ozone and steam. Used in braking systems using glycol (Dot 3 and 4) and silicone based fluids (Dot 5). (-30°C to +125°C). Excellent resistance to temperature extremes, flexible at low temperatures. Used in many food and pharmaceutical applications. (-40°C to +200°C). A tough abrasion and chemical resistant compound, yet with less elasticity than some materials. (-200°C to +250°C). Chloroprene is a good multi-purpose material, it exhibits fair oil resistance and good ozone and weather resistance. (-40°C to +110°C). An encapsulated O-ring comprises an elastomer energising core, which has a seamless fluoropolymer jacket. (-20°C to +200°C). Back-up rings are used with O-rings for both static and dynamic sealing applications. One of the most durable and resilient O-ring materials. A popular choice for enduring harsh environments. (-0°C to +330°C). Outstanding chemical and temperature resistance, with lots of non-standard options. (-50°C to +350°C). HNBR is treated with hydrogen producing high strength, greater thermal stability and reduced wear. (-30°C to +170°C). A unique compound that is often used in the automotive industry. Resistant to petroleum, steam, and other automotive fluids. (-5°C to 204°C). FEP Encapsulated Gaskets are designed to withstand almost all industrial chemicals and solvents. 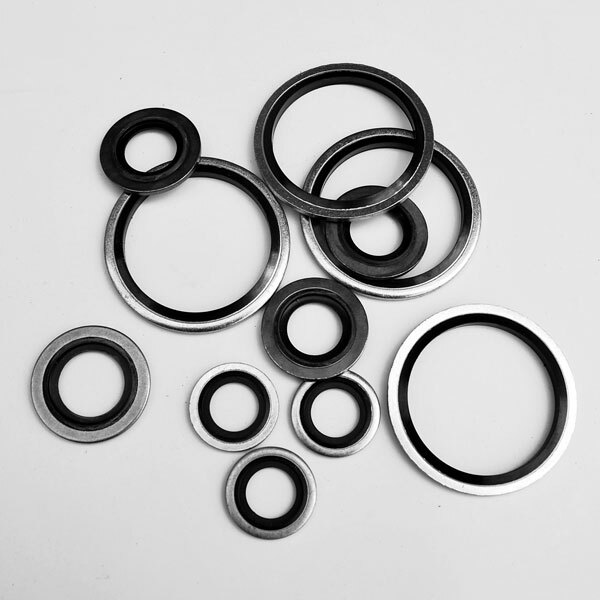 Bonded seals (or Dowty seals) are metal washer/rubber bonded inserts for use in high pressure applications where conventional seals are unsuitable. O-ring synthetic lubricant is used to prolong O-ring performance and assist in assembly. A range of O-ring kits in various different materials, including NBR, Viton®, EPDM, HNBR and Silicone.